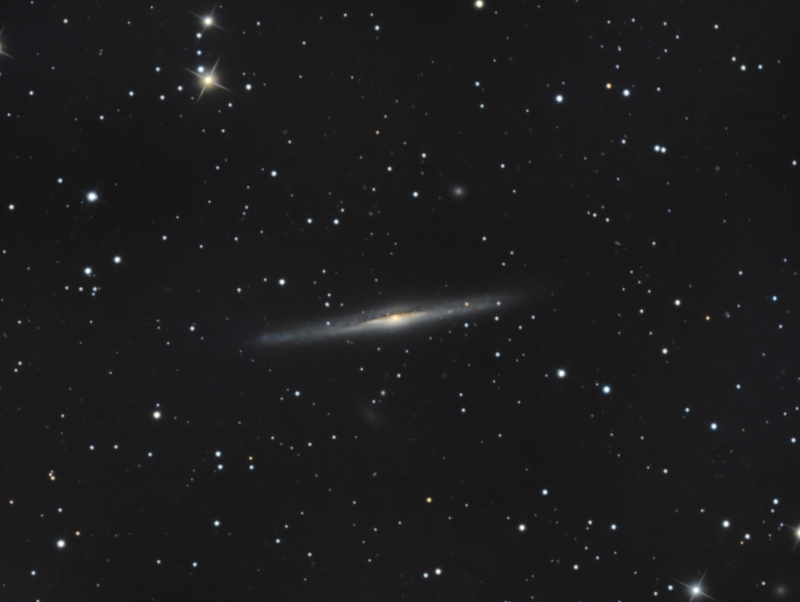 NGC 5170 is edge-on spiral galaxy about 96 million light-years away in the constellation Virgo. It has an apparent size of 9.9 x 1.2 arc minutes and shines at a mag 12.4. A prominent broad dark lane with mottled detail can be seen running about three quarters of the length of the galaxy - most prominent against the bright core area. That core area shows the yellowish hue of old stars commonly found there, with the bluer outer arm regions showing the hue of hot young stars. Exposure: LRGB: L:19x10min R:11x8 min, G:16x6 min, B:18x10 min for a total of 9.2 hrs.